Sleep apnea is a common but potentially serious condition where breathing repeatedly pauses during sleep, up to 400 times throughout the night. The pauses last 10 to 30 seconds, then breathing starts again in the form of a snort or gasp. When this happens, you move into light sleep mode and out of the deep, restorative REM sleep your body needs. 1. Obstructive sleep apnea (OSA) — the most common form that occurs when the tongue, tonsils, and other tissues in the back of the throat relax and block breathing passages, keeping air from getting through. 2. Central sleep apnea (CSA) — your brain doesn’t send proper signals to the muscles that control breathing. 3. Complex sleep apnea syndrome — when people have both obstructive and central sleep apnea. It’s estimated that more than 18 million Americans have sleep apnea. It’s more prevalent in people who are overweight, male, African-American, Latino or have others in their family with the disorder. Obstructive sleep apnea is common in children. Start with your primary care doctor, who will review your medical and family history and perform a physical exam. They may then refer you to a sleep specialist. This specialist could ask you to keep a sleep diary where you record your sleeping patterns. You may perform a home-based sleep test with a portable monitor or participate in a study using a polysomnogram (PSG) at a sleep clinic. The results of the test will allow your doctor to determine the best treatment for you. 1. Sleep position: Sleeping on your back allows gravity to pull the tissues in the throat down, making it easier for your airway to be blocked. Sleeping on your side can help to open up your throat. 2. Mouthpiece: For mild sleep apnea, your dentist can make you a custom mouthpiece that holds your lower jaw and tongue in the proper position while you sleep. 3. CPAP machine: When you have moderate to severe OSA, a CPAP machine could be the answer. CPAP stands for continuous positive airway pressure. A CPAP machine comes with a hose and a mask or nose piece that you wear throughout the night. The machine sends a steady stream of air into your airway to keep it open as you sleep. There are many styles available and most new models are virtually noiseless. 4. Surgery: Surgery to remove, shrink or stiffen floppy tissues in the mouth and throat that are blocking the airway can be an option for some. Narcolepsy is a neurological disorder that causes excessive daytime sleepiness and sporadic, uncontrollable episodes of falling asleep during the daytime. These episodes can occur anytime and during any activity. Narcolepsy affects as many as 200,000 Americans. Movies like My Own Private Idaho and Moulin Rouge! feature characters with narcolepsy, and many people are familiar with the term. However, the condition is often misunderstood and undiagnosed. Narcolepsy usually starts between the ages of 10 and 25 and is more common in men than women, as well as in people who are overweight. The exact cause of narcolepsy is undiscovered. Most people with the disorder have low levels of the chemical hypocretin, a neurochemical in the brain that helps regulate wakefulness and REM sleep. British Prime Minister Winston Churchill blamed his narcolepsy on long periods of irregular sleep. Symptoms of narcolepsy include excessive daytime sleepiness (even if the person has had a full amount of sleep at night), inability to concentrate, lack of energy, sexual disfunction, depression and fatigue. More troubling symptoms are hallucinations, sleep paralysis and cataplexy, a sudden, uncontrollable loss of muscle control triggered by intense emotions. • An overnight test using a polysomnogram that documents abnormalities in the sleep cycle. • A MSLT (multiple sleep latency test)—a test performed during the day that measures a person’s tendency to fall asleep and determines if isolated forms of REM sleep occur during waking hours. 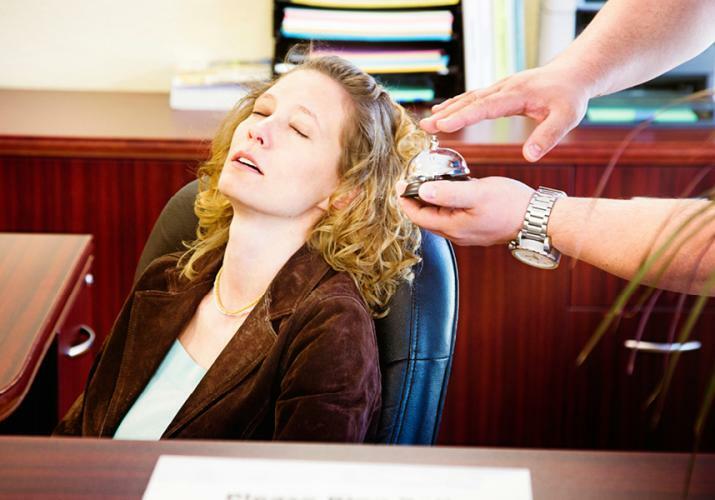 There is no cure for narcolepsy, but there are a number of drugs that can address the symptoms. They include stimulants for sleepiness and antidepressants for regulating abnormal REM sleep. Comedian and talk show host Jimmy Kimmel reportedly takes Provigil for his narcolepsy. Recently, a new drug called Xyrem was approved. Lifestyle adjustments (such as the ones listed later), plus sticking to a structured, regular exercise and meal schedule may also be beneficial. People with insomnia have difficulty falling asleep, staying asleep, and/or wake up too early in the morning. One out of three individuals will have insomnia at some point in their lives. Brief periods of sleeplessness that accompany stressful situations, like moving or starting a new job, are called acute insomnia. They are normal and should pass quickly without need for treatment. Chronic insomnia is disrupted sleep that happens at least three nights per week, lasting three months or more. If you find your periods of sleeplessness are lingering or occurring regularly, it’s time to see a doctor. refer you to a sleep specialist. If your sleeplessness is caused by anxiety or depression, they may refer you to a psychotherapist. Television producer Simon Cowell used hypnosis to treat his insomnia. There are a number of medications you can try for insomnia. A doctor, as part of a monitored treatment plan should prescribe them. Some are meant for longer use, while others should only be used for a short time. Your doctor can help recommend the treatment that is best for you, based on your medical history and lifestyle. Use caution with sleep medications as many can be habit forming, and use medication only when you need it. Over time, they may not work as well as when you first began using them. Discuss any changes you experience with your doctor. Over-the-counter products include melatonin, Valerian and sedating antihistamines like Unisom. Non-benzodiazepine prescription drugs like Ambien, Sonata and Lunesta work differently than the traditionally prescribed Valium and Xanax, and are less likely to make you feel groggy the next day. Antidepressants can also have a sedative effect. 1. Avoid stimulants like caffeine and tobacco (their affect can last up to 8 hours). 2. Don’t drink alcohol before bedtime. While it may make you feel drowsier, alcohol triggers lighter than normal sleep, so that you wake up more times during the night. 3. Don’t exercise three hours before bedtime. 4. Use the soothing sounds of a white noise machine to block ambient sounds and lull you to sleep. 5. An hour before bedtime, relax with a book (pass on action novels or thrillers), calming music, meditation or a warm bath. 6. Go to sleep at the same time each night and try to wake up at the same time each day, even on weekends. 7. Avoid going to sleep on a full or empty stomach. Is your bedroom sleep-friendly? Avoid using your bed for anything other than intimate activity and sleep. It shouldn’t be a place for work, so banish the cell phones and computers. Televisions and pets are also a distraction and shouldn’t be in your bedroom if you have trouble sleeping. Make sure that your bedroom is cool, comfortable and quiet. To keep it dark, use curtains that completely block light or wear a sleep mask. President Bill Clinton used to claim that he was fully functional on just five hours of sleep. He has revised his stance since having a heart attack in 2010 that he partly blamed on being overtired. When asked in 2008 what advice he had for President-elect Obama, he responded that it was not to get overtired, stating that most of the mistakes he’d made in his political career happened when he was fatigued. Clinton was right when he said that you make better decisions when you’re fully rested. If you have a sleep disorder, make a smart decision and schedule an appointment to talk to your doctor today about reclaiming your quality zzzs!